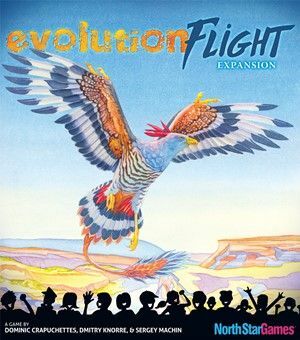 Evolution: Flight, an expansion for Evolution, introduces avian species into the ecosystem. Now your species can swoop on unsuspecting prey from above, fly away from predators, or soar to a new location when food is scarce. Will the ability to fly propel you to new heights? Or will it bring your downfall? Explore the expanding Evolution world and find out! * You must discard 2 cards instead of 1 to create a flying species. * Flying species have a maximum body size of 3 instead of 6. * Flying species have an upkeep cost of food equal to their Body Size. The upkeep cost simulates the amount of food needed to maintain wings. * Some of the new expansion traits, like Dive-Bomb and Brood Parasite, only work for flying creatures. * A species with Flight may take food from the Cliff, giving it an extra source of food. * A species with Flight cannot be attacked unless the attacking Carnivore also has the Flight trait. * If a species with Flight also has the Carnivore trait, you may discard from your hand to negate Symbiosis, Warning Call, or Climbing for when it attacks. The expansion changes tactics and strategy dramatically, but it doesn't change the base game's core mechanics, so it's easy to learn. In Evolution, players create and adapt their own species in a dynamic ecosystem with hungry predators and limited resources. With over 12000 different species to create, every game becomes a different adventure. Evolution: Climate is a standalone game that introduces climate into the Evolution game system.